A combination of 2 of the best Auto flowers in the business Auto Blueberry x Auto Sweet Tooth , Auto Blueberry has quickly become the connoisseur choice of autoflower. 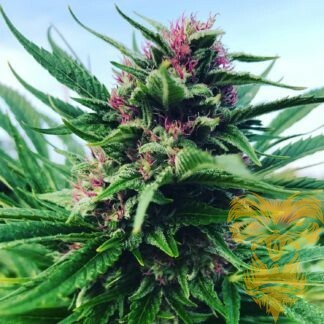 It combines the authentic Blueberry aroma and flavour thanks to a careful breeding program by Dutch Passion which crossed a very special Blueberry female with an indica dominant auto. 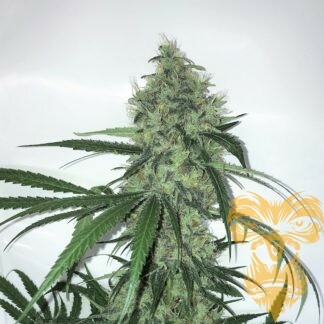 Selective back-crossing until the F4 generation gave a fully automatic Blueberry, the F4 was self-pollinated to create the F5 seeds which have become a must-grow variety for anyone looking for a luxurious genuine Blueberry experience in a fast autoflower form. Now crossed with the Sweet Tooth Auto That offers more than just an incredibly sweet and extra-smooth final effect. This legendary strain has an amazing THC percentage and an equally desirable 1.1 percent CBD level. Primarily an Indica strain with just enough Sativa to make it interesting, the Sweet Tooth Autoflowering is a genetic champion.Fans of Sweet Tooth Auto recommend this variety for a number of reasons. In addition to its easy-to-use, auto-flowering capabilities, it’s mould resistant, a heavy producer, and jam-packed with resin. If you enjoy a flavour and aroma that’s both sweet as sugar and smooth as silk along with a potent final effect, Auto Blue-Tooth will be an instant favorite.